Hanukkah is the Festival of Lights celebrated by Jewish communities as an eight-day holiday commemorating the rededication of the Holy Temple in Jerusalem at the time of the Maccabean Revolt during the second century B.C. 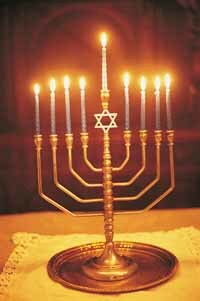 Hanukkah is observed this year for eight nights that began on Wednesday, Dec. 1, and continue through Thursday, Dec. 9. The festival is observed by the lighting of a menorah every day of the holiday. In observance and in celebration of Hanukkah, the Wood River Jewish Community will host a potluck dinner tonight, Dec. 3, at 6 p.m. at Our Lady of the Snows Catholic Church in Sun Valley. A Shabbat service will precede the dinner. Attendees are encouraged to bring their own menorah. In addition, those with last names starting with A-F are asked to bring a dessert or fruit salad, those with names ending in G-N should bring latkes, side dish or salad, and those with names starting with O-Z a potluck dish of brisket or chicken. The celebration is $15 for Jewish Community member adults, $25 for non-member adults, $5 for children ages 5-12 and free for children under 4. For reservations or to volunteer to make latkes, call 726-1183 or e-mail claudie@wrjc.org.